Nearly everyone in this room tonight is a member of a session, because nearly everyone here is a Ruling or Teaching Elder. “Session” is our Presbyterian term for the wise council of a congregation, the regular gathering of those Jesus calls to lead and teach and serve his people, so that they learn to walk in his way and to see that way in our lives. So I challenge you, whichever your part, Ruling or Teaching, play it well, for God’s glory and for the building up of his people. If your place at the session table is only an afterthought in your busy life, an unwelcome burden to be endured until the time your term expires, then let us not be surprised when, following our lead, Jesus’ own people see his spiritual body in much the same way. Instead, let each session be a church within a church: a gathering of Jesus’ disciples who commit to practice the very habits we all say we want to see in the lives of those we hope to see in church. Let us pray for one another, and pray with one another; let us read and reflect, deeply, on the witness of scripture; let us comfort one another in times of church challenge; more important still, let us challenge one another in times of church comfort. Ruling Elders, don’t just telegraph the complaints and anxieties you hear in the parking lot. Listen to your peers, of course, but always remember that we have ordained you to seek the mind of Jesus for his church. Work with your fellow elders, not only to lead the people, but to the BE the people, the people of God. You set the tone. You have the influence, as much in the parking lot as in any pulpit. Teaching Elders, provide for the session of which you are both member and moderator. Lead them in, and submit yourself to, the kind of community we all say we want to see in our congregations. Remember that if we only manage a church’s business, we may not have time left over for the business of making disciples. But when you make disciples of Jesus, you always get the church. Let session be the church, that the church might follow suit. May it be so, because Jesus has said it will be so. "Christian faith simply would not be, did it not hear, believe, and tell what once took place between the sixth day of one week and the first of that which followed. What keeps the heart of the Christian church beating, and its blood circulating, if not the story of those days, so endlessly rehearsed, with such infinite variety and such steadfast unalterableness? Sketched out by the very first preachers, subjected to profound reflection by the apostles, extended and elaborated four different ways by the evangelists, later reduced again to apothegms by the drafters of countless creeds and confessions, the story of Christ crucified, buried, and risen continues even now to be told and acted out, year by year and week by week. The worship of every Sunday is a fleshed-out echo of what Christians have heard happened that third day, that first day of the week. Likewise the church's hymns, when thoughtful, and her preaching, when faithful, reannounce the first proclamation of death's death and sin's atonement. Each act of baptism dramatizes the dying and rising again of the Savior as well as that of those he died and lives to save; and in every celebration of communion the same story is presented and re-presented with particular intensity and unique effect, red wine refocusing the savagery of execution on Golgotha and the breaking of bread re-releasing the astonished cries of recognition in Emmaus. Since none of these retellings of the story can be anything but symbolic and abbreviated, the Christian family takes time once a year to replay the events at their original speed — to experience for themselves the somber, then joyous, sequence, moment by moment. Through a few hours of worship and many of ordinary life, they relive annually the growing tensions of the climactic week; the grieving farewells, shameful betrayal, guilty denial, and agonizing fear of the night before the end; the long, dark, deadly day of pain and forsakenness itself; an ecstatic daybreak of miracle and color, song and newborn life; and in between one eerie, restless day of burial and waiting perhaps for nothing: a day which forces us to speak of hell and to conceive how it might be that God's own Son, and therefore God's own self, lay dead and cold within a sepulcher. Such is faith's story, which we are invited now to hear freshly as if for the first time; to think about with the widest stretching of our minds and our imaginations; and to make our own, as the key to learning how to live and even how to die." Take the word "ministry," for example. If you're getting your hair done downtown and the gal next to you says something like, "You know, so-and-so's son is going into the ministry" ... you'd never think to yourself, "Ah, he's getting ready to shovel his elderly neighbor's walk." Truth is, we've ruined a perfectly good formula (and the word) by making it more complicated than it needs to be. Ministry = Jesus' call + genuine need + our offering of time, talent, or treasure. 90% of the time, that's it. Forget going to seminary. And forget about paying someone in a robe to do ministry for you. Just look around the neighborhood. Don't overthink it. Do like the Presbyterians in Enon Valley do. Once a month, they invite the whole village downstairs into their square social hall. No overthinking going on here: just a plate full of spaghetti and meatballs (for example), and 119 (this night) of their friends and neighbors. Churched folks, yes. They come. But also unchurched folks. Lots of folks. The mayor was here. A mechanic and his parents. A teenager comes in for a bite before rushing off to opening night in the school play. An Amishman. Kids running around. This is not a soup line. This feels more like someone's dining room. Pass the butter and tell me what your grandkids are doing these days. What a blessing: an uncomplicated meal amid such complicated days. All this started six years ago, when unemployment in their end of the county kicked into high gear. Folks were hurting, worried. 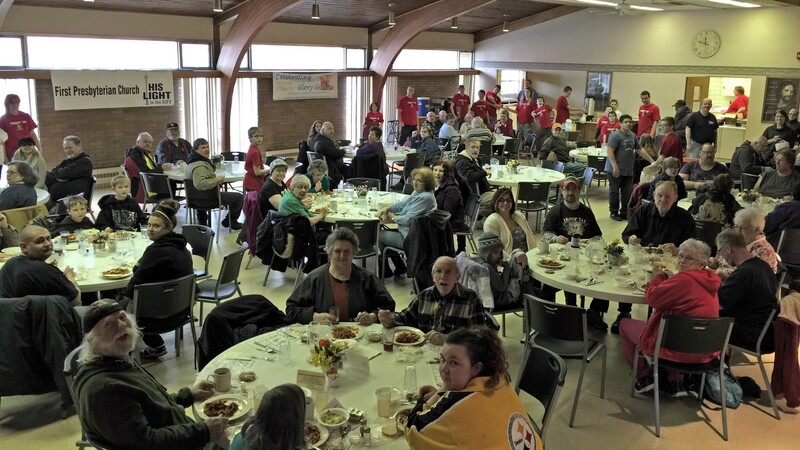 Enon church decided a meal a week would be the right kind of blessing in that kind of time. It was. Remember: Jesus' call + genuine need + our offering. Time went on, however, and some jobs came back around. That's good. It was acknowledged that something weekly was not needed anymore. That's good, too, in its own way. Yet by then, folks had discovered that the gathering would surely be missed if it went away altogether. So they've carried on. 100 folks a month can't be wrong. One year, thanks to donations from the Presbys who help out, the total cost to the church budget to serve more than a thousand folks was a remarkable $2. How's that for a ministry formula? Jesus' call + your community + meatballs ... or whatever you think will be a blessing. What ministry is the Holy Spirit nudging you to share in your #neighborhood? Don't overthink it. No one is playing dumb at First Church, New Castle, however—not about the people in their neighborhood. Twice a month on a Saturday, all throughout the year, some First folks get organized to ask the question again. The doors are opened to the Social Hall. Tables are set. Ovens are warmed. And neighbors trickle in from all around Jefferson Street. They call it Glory Grille. Indeed, some of you may have served. A great many groups have pitched in over the course of 10 glorious years. At this point, First must be inching their way toward 250 meals served since that first table setting. Folks at First learn twice a month who is really in their neighborhood. Once a sanctuary full of Suits and Hats, these days some at First wrestle with how the Holy Spirit is nudging them toward the neighbors who are actually along their stretch of Jefferson. That’s a tune all of our churches could be humming, whatever our streets are called. Who are the people in your church’s #neighborhood? There were many experiences for which I was reasonably prepared regarding my second visit to Cairo, Egypt. Having spent three days there during my college years, I had already been introduced to many of the standard sights. So this time around, I was better prepared for the sheer enormity of the pyramids. I was prepared for the old school feel of the national antiquities museum, like walking through the set of the first Indiana Jones movie. I was also prepared for Cairo’s sprawling traffic, jammed bumper to bumper in every direction. In short, it was good to be back in this remarkable, gargantuan city. But I was not prepared to meet the contemporary Synod of the Nile, the daughter denomination of American Presbyterian missionary efforts more than 150 years ago. I suppose I had a vague awareness that there were Presbyterians in that primeval land – stage for the ancient, dramatic Exodus narrative and later shelter for Jesus’ refugee family – but I had no idea that, these days, Presbyterians would number nearly half a million. Who knew there are nearly 400 Synod-established congregations and growing fellowships sprinkled up and down the Nile River? Who knew that Egypt is home to a third as many descendants of old Calvin and Knox as there are in the Presbyterian Church (USA)? Who knew that Presbyterians in and around Cairo are scrambling to plant fellowships and build church buildings amid that city’s constant expansion? Who knew that the Protestant seminary in Cairo, also 150 years old, is a vital force for education and training in the entire Middle East region? Who knew that the Synod is home to one of the Middle East’s most mature, long-standing social ministry efforts, the Coptic Evangelical Organization for Social Services – or “CEOSS,” as it is lovingly called by many. As we sat and listened to Egyptian young adults speak of job-training courses, skill-honing opportunities, and the inevitable positive contact between Christians and Muslims that results from so many of CEOSS’s on-the-ground ministries, I could not help but well up with a sense of grateful pride. It was not pride based on ownership, as if I or anyone in my generation of Presbyterians has been the source of such work. Rather, it was pride born of awe, a recognition of the faithfulness of the Holy Spirit through the ministries of this established church, now 150 years in the making. As a young Egyptian woman beamed with her own kind of pride, telling us how the church’s job-training program allowed her to earn her own money for the first time in her life, and about what a difference this was making in her daily living, I could not help but daydream back to those first North American missionaries. I could see them, nearly two centuries ago, packing up their possessions, saying goodbye to families and congregations, traveling to what then would have seemed a strange, formidable land. I could see them traveling up and down the Nile, giving birth to Christian fellowships, starting what would later become hospitals and schools, and instilling in their indigenous neighbors a sense of pride – not only for becoming theologically-informed followers of Jesus, but in being Egyptian, no less. I wondered: What would they think and feel, sitting here with me, listening to this young woman, whose life is being blessed and bettered through the ministry of a strong, established, focused, and vital denomination of Presbyterian Jesus-followers? Surely they, too, would well up in humble pride, meeting the grown-up Synod of the Nile. Surely they would burst out in songs of praise to a Faithful God, songs sung in the Arabic language those first missionaries came to know so well. I was ready to stand next to the pyramids again, enormous and steady as they have proven to be. I was not prepared, however, to experience today’s Synod the Nile – surely one of the global Christian movement’s better stories of growth and faithfulness.